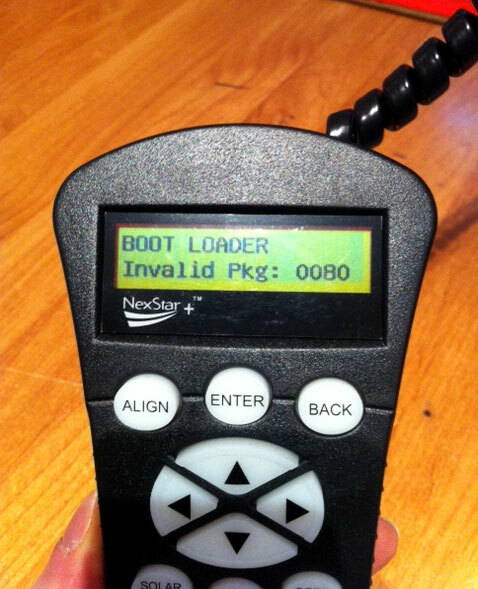 Over the past few weeks I have been contacted by a small number of customers as their SLT / SE scopes are showing ‘Boot Load Error’ on the handset when turning on the scope. My advice, don’t panic ! It can be hugely frustrating I agree, but can be easily rectified by a quick download from the Celestron website http://bit.ly/WE9MCB. Click the link and save the downloaded Zip file, then simply unzip into a folder connect the handset data cable that was supplied with your scope (if you don’t have one we can supply one for you), turn on the scope (you may need to hold the ‘menu’ & ‘Logo’ buttons together whilst doing this) and run the program called CFM that you have just unzipped. The program then scans your serial ports looking for the scope and guides you through the rest of the process to re-install the handset firmware. The only snag maybe that you don’t have a serial port on your PC, if you don’t have one we can supply a USB – Serial port adapter to you. The whole process takes about 5 minutes and you shoud then be back up and running. If you get into problems remember we are only a phone call away.